Recently, I reviewed Walk All Night: A Drum Beat Journey 2016, a documentary shown at the Black Harvest Film Festival (BHFF). I interviewed one of the directors, Kate Benzchawel. We talked about the film and how women are treated as the minority in the film industry. Q: How did the concept for Walk All Night: A Drum Beat Journey come together? A: Originally a friend of mine who was a social worker at the Urban League, Elilta Tewelde, wanted to create a program to connect bucket drummers to traditional African Drumming. So myself and the co-director [Mallory Sohmer] were both in the film industry and she approached us to do a crowdfunding video for her. That’s how we originally got involved. Working in the Urban League, she was always interfacing with different young people. Just in her commute to work she would speak to a lot of the bucket drummers that she would cross paths with everyday. That’s how she came up with the idea to put this program together to select a small group and teach them some traditional drumming and connect them to a culture element that they might night be exposed to. Q: How long did the film take to make? We started in 2012. We completed in 2016. We shot 2012-2014, did some pickups but our main production was over a two-year period and we were in post for two years. Q: How did everyone get together? She originally met one young man Damonte Williams and he actually introduced her to his three cousins. But she spoke to a lot of different people and ultimately these are the four she decided on. She connected with their families, visited with them and spoke with them about this concept on whether or not they wanted to be involved in this trip. Q: I know one of the grandmothers was kind of iffy about this trip. Gracie was the grandmother who brought some serious questions to the table. I think a lot of people thought the idea was a little crazy to be honest, at first. And Elilta was so embedded with it. She was so passionate about it and she definitely had to have those conversations. Q: So, basically due to her involvement and her deep passion, that’s pretty much why the film was made? Yeah, Elilta felt that the trip was very important and the experience was very important. And she really wanted to document that experience. I think in theory she was hoping to maybe continue on the program going forward. But she came to us and said, “look you guys are involved in this. I want you to document this, I want a film to be made out of this experience.” And so the three of us worked very closely to collaborate just to get the trip off the ground. We did some crowd sourcing just to get the young men there. We raised $14,000 during our first campaign. So that covered flight, accommodations and the educational component. We got a grant from the Awesome Foundation for post production and Rhythm and Dance was our fiscal sponsor. They were our partner. We did a post production campaign as well and we raised about $3,500 from that. And had three physical fundraisers. Q: Was there a specific budget for the film? We had a projected budget was about $30,000 but we exceeded that. We had a budget for editing, color and audio. So those were the three people that were compensated. Everyone else volunteered their time. Q: How was the movie received? We have premiered at the San Francisco Black Film Festival last month. It was very well received there. Elilta, Mallory and myself were all present. The response was very positive. General response was a lot of desire to share it. Whether it be local colleges or universities. That was the main response. We’ve gotten really great reviews on our social media. A lot of people were just extremely happy to see these young people given the opportunity, period. Q: When did you get into film and production? I’ve been a video producer with a non-profit organization for 10 years. My work focuses on covering humanitarian work worldwide and telling stories of that work. Photography has always been a passion of mine, but working in the film industry and being part of the transition from analog to digital has been fascinating. The digital tools available to capture stories are amazing. Q: As far as filmmaking goes, I understand that it’s male dominated. Do you consider yourself a minority in the field and if so how does that make you feel? I think that the industry is male-dominated. It is changing though, It’s slow, but it’s changing. I do know a lot of independent women filmmakers. For Walk All Night, our team comprised of several women; directors/producers, executive producer, our editor and original music composer. I think with any industry that people are under-represented, it takes time. I do believe it’s happening. I don’t believe on the Hollywood scale or the Academy but there are a lot of people who are stepping out and making movies or shooting and it gives people the voice that they may not have ever had, or a choice. So they can try, they can make their own film if they want and they don’t need that validation. Q: Is there stigmatism being a women in that industry? Absolutely! I work with three male editors and two producers and I have had to deal with it personally. It’s a matter of how people communicate with women, the words used and the delivery. It’s how you communicate with me versus how you do with my male counterpart. And it’s a reminder to have the courage at that point and say ‘I’m sorry, you can’t speak with me that way.’ That takes time. But I’ve definitely experienced it. It was actually really amazing to work with a woman editor in this in producing Walk All Night. Q: Speaking of your experience on working with other women within the industry, do you think it’s more of an uplifting environment? Yes! There’s a huge support and I think we have to support each other. We have to work a lot harder to be heard and to be seen. I work with a lot of amazing males in the industry as well. But, I think the way is to really support and invest in each other. Q: Did you have any other statements, questions? I really believe that the project in general benefited from collaboration Elilta and the Rhythm and Dance Foundation in D.C. which were two men who focused on African drum and dance, and they were the conduit to Senegal so I think that partnership that she created was so instrumental because she was able to recognize that as a woman, she may not be the best fit for this. And these four young men really needed to sit with men and be with men and learn that respect and understanding. So she was able to do that and bring these people into these young men’s lives and it’s amazing. First image: Co-directors Mallory Sohmer and Kate Benzschawel capturing b-roll with DaMonte. 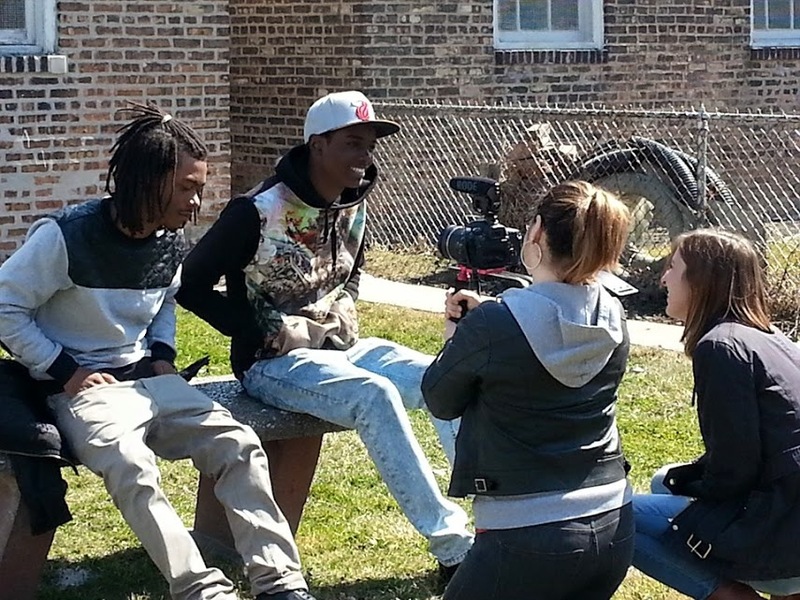 Second: Co-directors Kate Benzschawel and Mallory Sohmer interviewing brothers Demetrius and D'Quan. Third: Co-directors/producers Kate Benzschawel and Mallory Sohmer.